I'm off work this week, hooray! And aswell as a bit of family time, I'm getting through a few jobs in the polytunne. 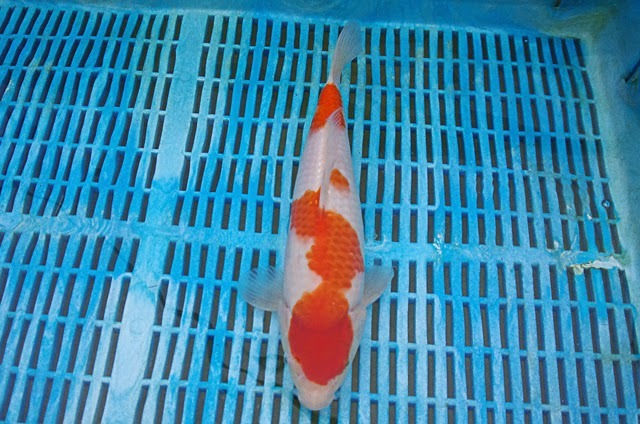 I finished off selections on the Jul 14 kohaku's, and out of 280 or so, I kept around 50. Some tough decisions with some of them, but I'm happy with the end result. 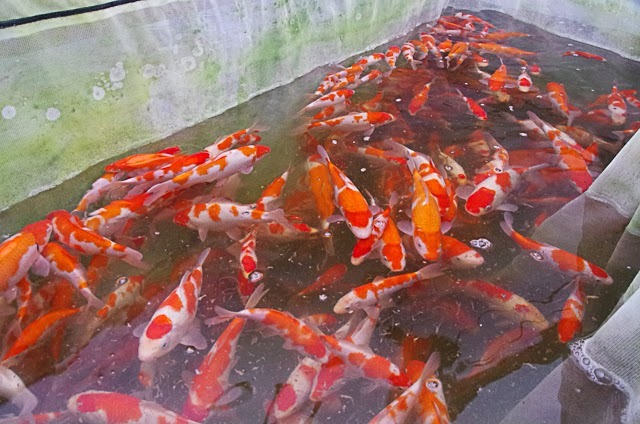 That's 50 koi between 17cm and 29cm to continue growing for the next 2 to 3 months. I'm holding the growing on tank temp fairly low so I can transfer the to my "ebay" tank and then I'll be cranking up the temp once again, and with a bit of luck (and ambiant air temps of at least 5C so the air source heap pumps work more effectively), I hope to reach my growing on temperatures of around 24C. Notice the gin rin scales - which i'm led to believe is a sign the skin will develop nicely. It's too early to be drawing conclusions - I think I'll be hanging onto this one for a while so we can track it. 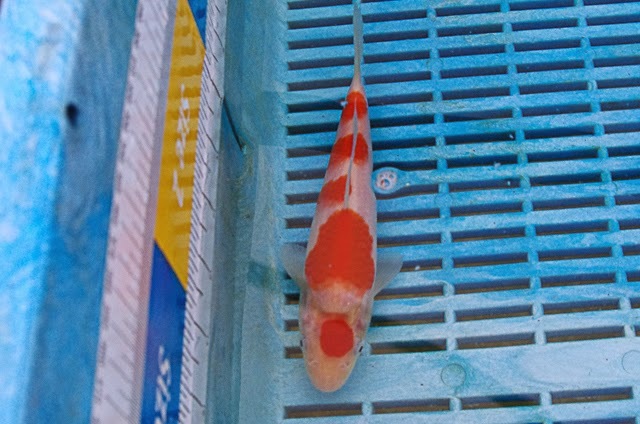 What I'm more worried about is the profile of the underside of this koi. The picture below doesnt show it well, but I will be keeping a close eye particularly on the lower part of the side, towards the front end where it meets the head. Nothing health wise to worry about - I'm thinking ahead to koi shows, and you dont want the body to pinch in at that point which would be a demerit. I've seen some fish from this spawning with that body shape demerit, and it's something I'll continue to watch and feed back on. the other interesting thing I'm watching on this koi is the red - it's the largest of the spawning, and perhaps that rapid growth has stretched the red. you see it darker are the base of the scale and lighter at the outer part of the scale. 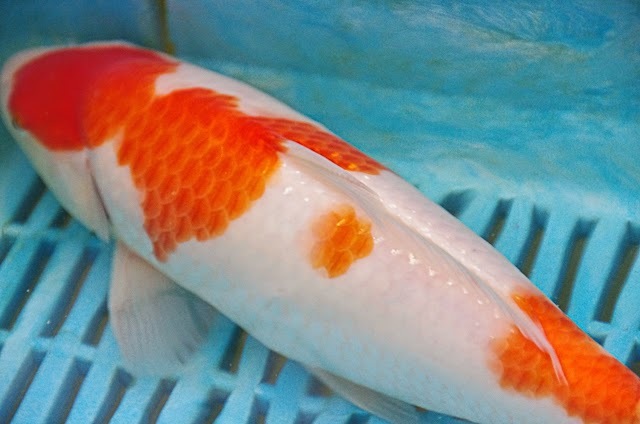 I think over time that difference will lesson - like on the May 14 kohaku's. Another point to keep an eye on.